Design an in-store visual experience that engages and inspires women to be physically active in order to achieve their fitness goals. Under Armour Global Brand Creative Environments team: Kristian Espinosa, Nathan Grundhauser, and Eric Ducan. Under Armour is a human performance athletic brand. As an athlete, I have always felt incredibly inspired by people who set out to achieve their goals. Many gyms have a motivational board that highlights individual goals and success (person records). Standing before this wall, that documented people’s ambitions and successes, I too wanted to make a change in my own life. I was reminded of Candy Chang's interactive, Before I Die, wall that holds similar qualities of inviting the viewer to reflect and share in a public space. I wondered: How could this type of goal setting become digital? How could we leverage Under Armour's community of women to inspire each other at all levels of fitness? This begins with the newbie runner beginning her journey, who says, "I will….run my first 3K" …. all the way to the more experienced athlete, who says, "I will…. climb Annapurna". I began thinking about goal setting; using the phrase "I will ........". Step 1: Define and share your goal. This activation invites women to share their goals taking the first step toward improving their personal health and wellbeing. Step 2: Document your progress: After signing up and creating a goal, the information links with UA Record, the world's first 24/7 connected health and fitness system. UA Record is designed to give users personalized insights to help them achieve their performance goals. 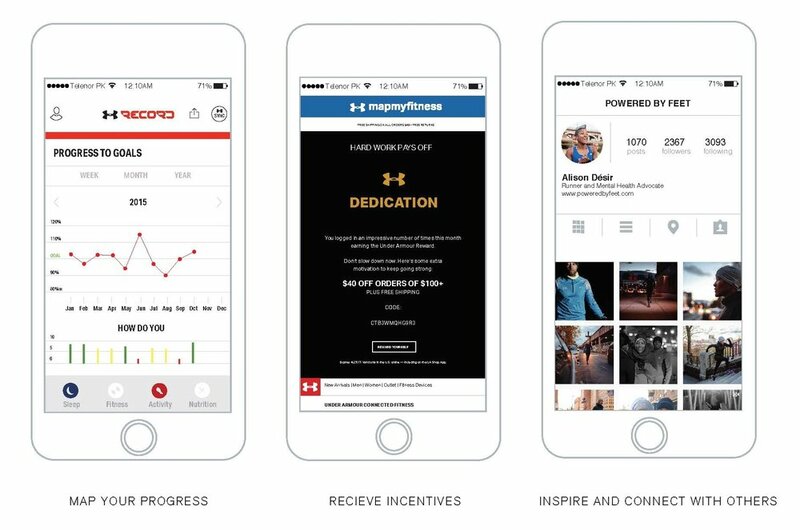 Under Armour's, Map My Fitness, rewards the athlete for their dedication with a 40% off product incentive. Step 3: Connect to a community: UA Record is an effective way to connect with people in your area working on the same goals and motivating them to keep up the momentum. #IWILL is a digital campaign empowering women striving to improve their health and wellbeing through setting goals, tracking progress, and sharing their personal set backs and successes along the way. The initiative began with the activation of a digital wall that exhibited women's goals populating the #IWILL. The content was generated by women documenting their personal fitness goals. This display reflects women of all levels of fitness working hard to better themselves.